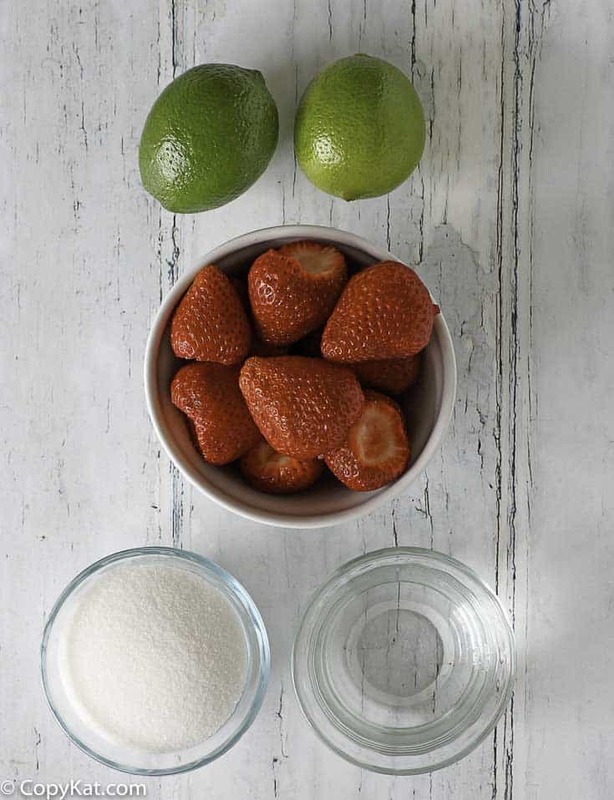 Make your own Sonic Strawberry Limeade at home! The Sonic Strawberry Limeade is a delicious drink that you can enjoy all year around. The hardest part of this drink is the strawberry syrup, but I will show you how to make your own strawberry syrup. Do you love copycat Sonic recipes? I have a lot of copycat Sonic Menu Items on the blog. Sonic is America’s Drive Inn, and they have over 100,000 drink combinations. I am going to show you how to you can take care of drinks that need strawberry syrup. I think one of the best things about recreating recipes at home is you can stay away from many preservatives and dyes. Homemade Strawberry syrup has a beautiful color, and there is no dye in this recipe. My recipe is made with sugar, if you want to try making your version with a sugar-free substitute, please let me know how it goes. This recipe is tested only for sugar. You will begin with 1 pound of fresh strawberries. You will wash them, hull them, and cut those strawberries into small pieces. You will then cook the strawberries for about 20 minutes, what results is a beautiful colored juice, but it isn’t sweet yet. You will remove the strawberries, and compost them if you desire. Then we will add the sugar, and heat just a bit more. You can then store the syrup in a clean container, I recommend storing the syrup in the refrigerator. It is ok for a couple of weeks. Next, we will assemble the Sonic Strawberry Limeade. You will grab a glass, fill it with ice, and then make your drink. I add about 1 part of strawberry syrup to 4 parts of Sprite. I top with some lime slices or quarters, and there you go. You can make strawberry lemonade, or even strawberry soda if you desire. I hope you enjoy this Sonic Strawberry Limeade. Love Sonic Drinks? Check out these other favorite Sonic Drinks. A Sonic Strawberry Limeade is so easy to make at home. To make strawberry syrup wash and hull your strawberries. Cut strawberries into quarters. Place strawberries into a pot and add 32 ounces of water. Bring to a boil, then simmer for 15 minutes. Strain liquid, discard the strawberries. Add sugar, and cook for 5 additional minutes. Skim off any impurities on the top of the syrup. Pour into a container, and allow to cool. 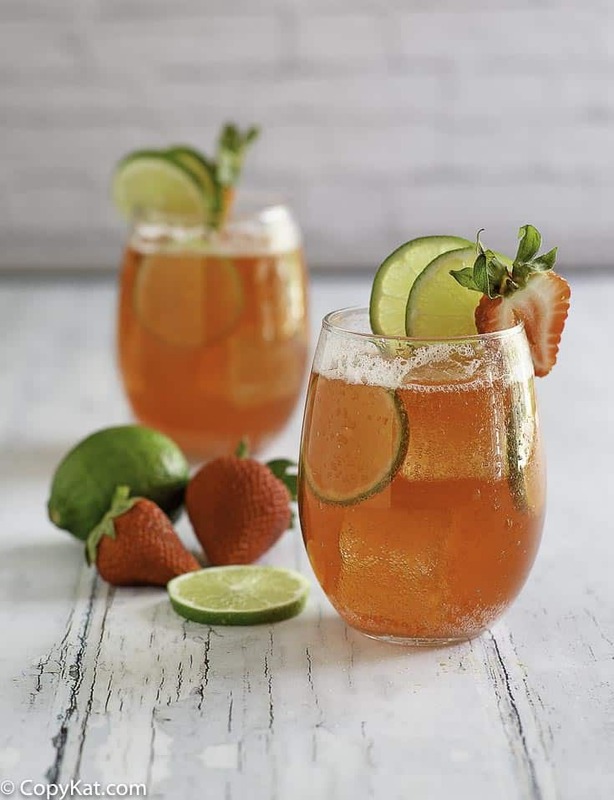 Store the syrup in the refrigerator for up to two weeks.To make the Strawberry Limeade, fill a glass with ice, add 1/4 cup strawberry syrup, 1 cup of Sprite, and stir well. Add lime wedges, and garnish with a strawberry if desired. Thanks for sharing all of your wonderful recipes. I have always loved Sonic too My very favorite Sonic drink is one that I don’t believe they offer anymore. When Sonic first came to our town, I discovered Lemon Sours. I went there all the time to get them. After some time, Lemon Sours went away, along with Sonic, After several years, Sonic came back! I rushed down there to get a lemon sour. The girl at the drive through just looked at me when I ordered one – with lots of salt. I have searched for a recipe for this favorite of mine, but haven’t found the right one. If you have it, would you please post it? Thanks so much! I have never heard of their lemon sours. I’ll have to do some research. Hi Stephanie, love your website. I want to tell you though, that you forgot to write an important instruction in your recipe. In the video, you say and show us how to scoop out the strawberries, with a sieve, after they are cooked. It’s not in the directions. Also the video says to pour the syrup into an air-tight bottle. That is not in the directions either. Can’t wait to make this. Just last week I had bought a box of strawberries and made strawberry shortcake. Could have made this recipe if I knew about this. Will be going back to the store soon to get more. Yummm.